For optimal performance the inner ring should be as close to circular as possible. • Use the scope Zoom slider to zoom in or out as necessary. 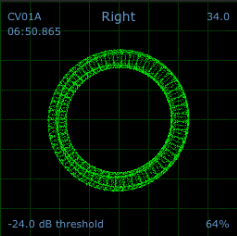 • Use the scope L/R balance and P/A balance controls to adjust the shape of the inner ring. The top left corner of the scope view displays which control signal Serato DJ is reading (the example above shows it is CV02B, which translates as control vinyl, version 2, side B). The number below gives the current absolute position within the control vinyl or CD. The top right corner shows the current speed in RPM. 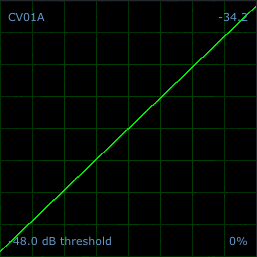 The bottom left corner is the current threshold setting. The bottom right corner shows the percentage of readable signal – this number should be as close to 100% as possible when your system is calibrated properly. At values of less than 85% you may start to experience tracking difficulties. Many playback problems that you encounter when using Serato DJ can be attributed to not getting a good reading of the control signal from your vinyl or CDs. The scopes are a great tool for diagnosing what is happening. Following are the most common scope views you may encounter with suggestions to help you solve the problems they can represent. Note: Some problems cause similar looking scopes (eg. dusty needle and damaged needle) so it is recommended to try all suggested solutions until your problem is solved. Serato DJ is receiving no signal at all. Check connections and ensure you've set up correctly. If trouble persists try swapping out your RCA cables. A CD Player (line level) is connected to a phono level input. If using an SL box or Mixer with dip-switches, ensure the audio input level is set to line. A Turntable (phono level) is connected to a line level input. If using an SL box or Mixer with dip-switches, ensure the audio input level is set to phono. The left channel signal is missing. If using CDJs, ensure that the RCA cables are properly connected. If using Turntables, ensure the cables are properly connected, the wires from the cartridge to the headshell are connected and that the headshell connectors are clean and it is screwed in tightly. The right channel signal is missing. If using CDJs, ensure that the RCA cables are properly connected. If using Turntables, ensure the cables are properly connected, the wires from the cartridge to the headshell are connected and that the headshell connectors are clean and it is screwed in tightly. The left and right channels have been summed to mono. Ensure your cables are properly connected and try swapping headshells. If this fails you my need to have your turntables serviced. Serato DJ is receiving a signal but the left channel has been lost with a noisy, loose connection. Check your RCA cables are securely connected. If you still have this problem try replacing your RCA cables. Serato DJ is receiving a signal but the right channel has been lost with a noisy, loose connection. Check your RCA cables are securely connected. If you still have this problem try replacing your RCA cables. The right signal has been lost with a noisy loose connection and is receiving left channel crosstalk. Check your RCA cables are securely connected and your setup is not close to large electrical sources. If you still have this problem try replacing your RCA cables. Bass is reaching the stylus and is causing bad turntable vibration. Try and isolate the turntables from the speakers. Turntable is not grounded and very susceptible to interference. Ground your turntable. The RCA cables connecting your turntable or CDJ to Serato DJ are piggybacked (ie. two or more cables linked together)and the signal is being lost. Connect your turntable or CDJ directly using one cable only. This section of the control vinyl has been worn and might not track properly. It is recommended that you replace the control vinyl. Your control vinyl is very badly worn and will not track properly, possibly not at all. Swap sides and order new control vinyl ASAP. Dust is preventing the stylus from tracking in the groove correctly. Clean your stylus and control vinyl to ensure they are dust free. The stylus is damaged. Try reseating and cleaning your stylus. If this doesn't solve your problem you will need to replace your stylus. The tonearm is too light, causing the stylus to not sit heavily enough on the control vinyl making it susceptible to dust and vibration. Adjust the tonearm weight to make it heavier. If the tonearm weight is at its maximum try adding weights to the headshell. The tonearm is extremely light so the stylus isn't sitting in the groove and won't track. Adjust the tonearm weight to make it heavier. If the tonearm weight is at its maximum try adding weights to the headshell. Master Tempo is being used on the CDJ, which scrambles the control CD signal. Scope view becomes more obvious when Tempo fader is moved up or down. Turn off Master Tempo to resolve.